NOTE: AFTER PROBLEMS WITH THE RSS FEEDS OF THE ORIGINAL POST, THIS IS A RE-POST TO MAKE SURE ALL RSS READERS CATCH THE WINTER 2009 PREMIERE AND RETURNING TV SHOW GUIDE. Christmas time is almost here and many of you will be searching for those last-minute presents, drinking eggnog and watching Christmas specials, but its also a good time to see what's coming in the TV world in the new year. All of our favorite shows are either in hibernation or just winding down for 2008. But very soon, we'll again be bombarded with even more Television including many anticipated series premieres. I've gathered as much about the Winter 2009 TV Schedule as I can and there are several premieres included. Wanting to know when that show from the Fall season is returning? Or maybe you're curious about what new shows are starting January - March? The Winter 2009 season will soon be upon us so I have compiled the complete Guide to the Winter 2009 TV season for you. I've included the premieres for Fox, NBC, ABC, CBS, SciFi, CW and more. The chart below guides you through the entire Winter 2009 TV Season by date. Season/series premieres will have their season number in the "season premiere" column as well as being marked in bold text. All start times are U.S. Eastern time. There are some shows that may have a special premiere date and then follow later that week in their normal time slot day - in these cases I only show the first premiere. GeekTonic will have a weekly preview of new Winter 2009 airings each Sunday and noting those that will air in HD as well as more information about each series/season premiere in those posts as well. New Premieres include: Dollhouse, Kings, Castle, The Unusuals, Lie to Me, Tyler Perry's Meet the Browns, The United States of Tara, East Bound and Down, Secret Life of the American Teenager, The Beast, Lie to Me, Trust Me and Harpers Island. New Reality/game-shows include: Howie Do It, Confessions of a Teen Idol, Superstars of Dance, True Beauty, Homeland Security, 13: Fear is Real, Tool Academy, RelicQuest, The Exterminators and more. Returning Reality shows include: The Bachelor, The Real World, The Apprentice, American Idol, Amazing Race, Survivor, Dancing with the Stars, Superstars of Dance and more. Returning Drama and Comedy includes: Lost, 24, Scrubs, Damages, Medium, Psych, Monk, Kyle XY, Battlestar Galactica, Friday Night Lights, Reaper and more. It's quite obvious that the networks are moving towards fewer quality dramas and more cheap, reality-type programming. I'll have to do some stats on the shows from the Winter 2009 listing to see what percent are non-scripted shows - I'm betting it's pretty high unfortunately. New and returning TV shows on the most anticipated list include: Lost, 24, Dollhouse, Battlestar Galactica, Kings, Reaper, Damages and unfortunately (in my opinion) American Idol. 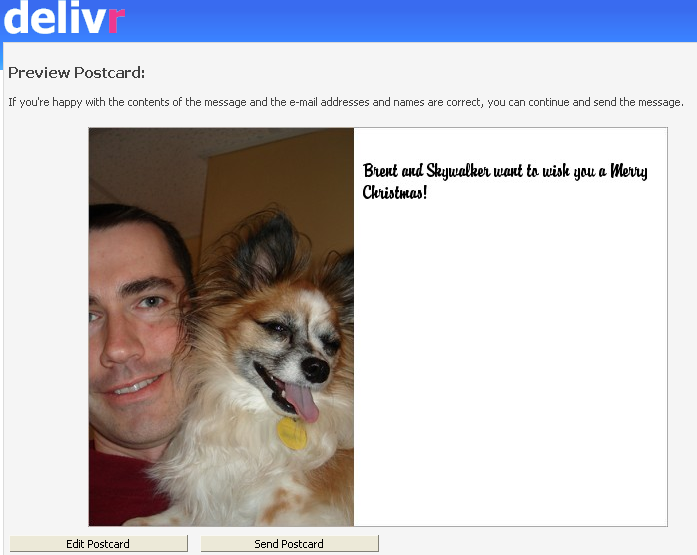 Time has run out if you want to send a Holiday Card this Christmas season via snail mail. For those of you procrastinators who haven't sent their Holiday cards or just don't like the snail mail route I have the perfect solution. One of my favorite flickr hacks is a site called Delivr. 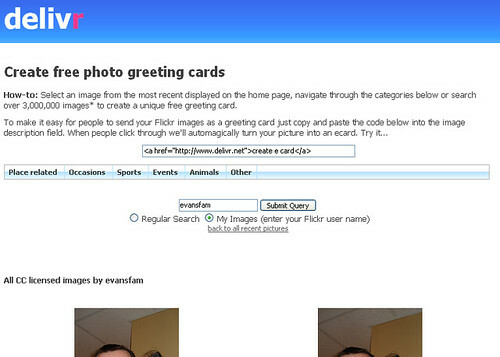 Delivr is an excellent example of the many sites that use the Flickr API to extend the use of Flickr. Select a category such as place-related, occasions, sports, events, animals or other. These are based on tags and your results will vary here as it only gives you one photo per sub-category like xmas for instance. Do a search by typing in one or more tags and click on the submit query button. For instance I searched for Christmas Card and it pulled up 20 different photos of which several would be appropriate for a card. Lastly, you can select your photo by typing in a username (I used mine of course) and use one of your flickr photos. 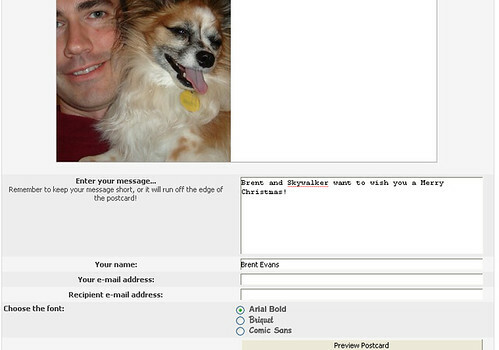 In my example below, I used a photo I took of my dog and I just to give it that personal touch. Click on the photo you want to use in your card with your mouse. Now type in a short message, your name, your e-mail, the e-mail of the person you're sending the e-card to and select a font. Click on the Preview button to get a quick preview of how the card will look to your receiver. 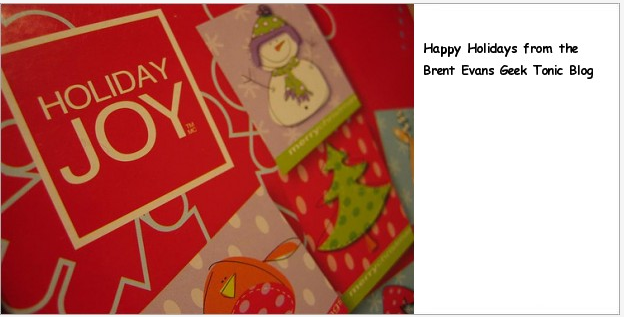 From here you can either edit the card to make a change or you can send the e-card. The end result looks quite nice (hey it ought to especially if you used one of your own photos right!) plus it's free and fast. Now you can save yourself a stamp and the cost of a card and your card will be more personal to boot. Happy Holidays! For more flickr hacks head over to the ultimate flickr hacks page where I've collected links to over 300 different flickr hacks, scripts and add-ons. Its getting difficult to find any new television programming on your TV sets these days thanks to the writers strike, but starting today the College Football Bowl season officially begins with the San Diego Co. Credit Union Poinsettia Bowl on ESPN and runs through January 8th for the BCS Championship in New Orleans. If you're a sports fan, check out my ultimate guide to the College Football Bowl Games. It includes a complete listing of all of the games, times, locations and teams as well as a Google Maps Mashup showing the locations of each of the bowl games. Netflix has a nice Vacation-Hold Feature they've added in the past year that is really nice. Being a long-time Netflix subscriber I've always struggled with how to deal with times when I'm on vacation or going through weeks when I'm too busy to watch the movies Netflix sends me. I was already paying for a full month subscription and didn't get the value from those days after I canceled (unless I canceled right at the end of the subscription period). While the account was canceled I couldn't access my queue, history or account information. The queue was still there when I reactivated, but there was no way to manage my queue during that time. This was a problem for me because I might hear about a movie I wanted to rent when I re-activated the account and I like to do it while I'm thinking about it. There was no way to automatically re-subscribe at a certain date. Now that Netflix has a Vacation on Hold feature its pretty easy to put your Netflix account on hold for a short duration. You can put your account on hold for 7 - 90 days during which time no DVDs will be shipped and you won't be billed. 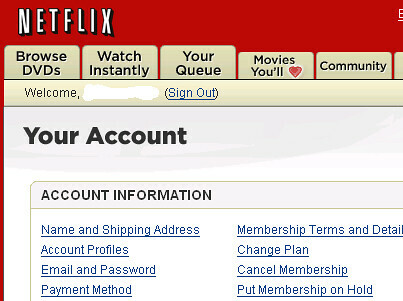 Any Netflix DVDs you have out when you put the account on hold must be returned within 7 days to avoid a penalty fee. Once your account is reactivated (hold period is over), your account is billed immediately and your new billing date becomes your reactivation date. First you go to your account information page and select "put membership on hold". Note that your account will be put on hold the moment you click the "start account hold now" button. At the bottom of the page you choose the date to automatically reactivate your account - I'm selecting the day before I return from vacation so I'll have the next movie in my queue waiting for me when I return. The last page you see is a notice your account is on hold. You'll see this warning/reminder on all of your Netflix pages (queue etc). You can reactivate your account even before the date you had originally selected - nice feature for those of us that change our mind. That's it. I'm testing this feature out as I write this so I'll let you know how it goes. My strategy was to wait to put the account on hold until the end of yesterday after the last movie shipment was confirmed in my queue. I should get that movie today in the mail and can watch it tonight. I'll then return it before I leave for vacation (save me that penalty fee) and it will reactivate right as I'm returning from vacation. If you've ever used this feature on Netflix let me know how it went in the comments. Xbox 360 Red Ring of Death Still a Problem? I was at the UPS store shipping a few packages and realized there were two different people (unrelated) in the store with XBox360's on their way to be repaired. I asked them about it and they both said their XBox360 quit working and they were experiencing the "Red Ring of Death." Then the UPS guy behind the desk said there had already been four others today shipping their 360's with the same problem. This surprised me because I thought Microsoft had worked out those issues. For those of you who haven't heard of the Red Ring of Death, you can read this wiki article. It says the red lights on the indicator "ring" represent "general hardware failure" and is known by gamers as the infamous "Red Ring of Death." Anyone else seen this problem on their XBox 360? Is it only with the older units?